A disposable helium balloon gas cylinder which can fill Approximately 30x 9" inch latex balloons, 16x12" latex balloons & 9x 18" Foil Balloons. 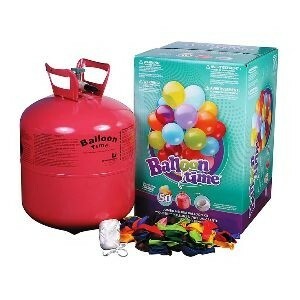 It avoids the inconvenience of visiting a local florist or stationery shop for balloon filling. * Easy to use, just open the valve on the top of the cannister and press the rubber nozzle to release the gas. Full instructions are included. A disposable helium balloon gas cylinder which can fill Approximately 30x 9" inch latex balloons, 16x 12" latex balloons & 9x 18" Foil Balloons. It is perfect for adding colour and excitement to a celebration whether it be in the home, workplace or other venue and avoids the inconvenience of visiting a local florist or stationery shop for balloon filling. * There is no need for a deposit and no need to return the cylinder to us. * At only 4.7kgs the package is lightweight and portable. * As you would expect from BOC, this conforms fully to the required European Standard EN12205 and can be fully recycled. * Easy to use, just open the valve on the top of the cannister and press the rubber nozzle to release the gas. Full instructions are included. Latex balloons should be inflated 1-2 hours before the party and will float for approximately 10-12 hours. Foil balloons will stay inflated for approximately 1 week. BOC and BabiesBabies are fully aware of, and committed to, their duty of care and environmental obligations. As such, this cylinder can be fully recycled. Please dispose of at your local waste department (refuse centre). The telephone number is usually in your local directory. Please note - Delivery to UK Mainland only. Balloons NOT included.